New York Window Fashions specializes in custom window treatments design, installation and integration for residential and commercial clients in NYC and South Florida. We offer a variety of automated and manual shading solutions for Interior windows and doors. We work with the industry’s finest brands, including Hunter Douglas, Somfy, Lutron, Phifer, Mechoshade, Crestron and many more. We service the full spectrum of commercial and residential applications - from single rooms, offices, and media spaces to building-wide automation. Our skilled craftspeople are experienced in accommodating every electrical, construction, painting, installation and integration requirement – no matter the complexity. We are an exclusive designer's studio and workroom with a European touch, good taste, and true craftsmanship specializing in design window treatments, upholstery, slipcovers, pillows, etc. and well known for the impeccable quality, taste, and versatility, prompt delivery, and competitive pricing. Larisa founded Solomonic Couture for the Home in 2002. Her passion for couture, impeccable work, and attention to detail has driven Solomonic to be recognized by designers, decorators, and couture store owners. Budget Blinds of Ossining offers complimentary in-home consultations with our design experts, allowing you to envision the look of the treatments in your home. This beats running from store to store or taking your chances online! We’ll measure your windows, do the ordering, inspect your window coverings on delivery, install them perfectly and empower you with our "No Questions Asked Warranty"! Our selection of window treatments includes shutters, blinds, shades, and draperies! Regardless of the window’s size or shape, you can rest assured that we will have a customized window coverings solution ready for you. Let’s get started planning your new custom window coverings today! Call (914) 747-2619! Curtain Call CT specializes in the design and fabrication of custom window treatments, draperies, valances, Roman shades, bedspreads, cushions, and pillows for your home. Curtain Call is a Hunter Douglas dealer; we incorporate the use of blinds, shades and shutters in our designs when indicated. Hunter Douglas shutters are the best in the business and come with a Lifetime Warranty. 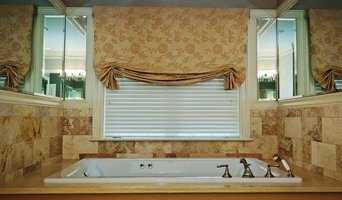 Owner Adrienne Micci-Smith is a custom window treatment professional. Having earned her designation at the Custom Home Furnishings School in Charlotte N.C., Adrienne and her team of professionals will bring everything you need to your home, whether custom or ready-made. Interior Solutions is a design firm that believes the most successful designs are achieved by understanding a client’s vision combined with a mastery of the design process. We specialize in helping guide homeowners with transforming the vision they have for their home into a reality. Interior Solutions was founded by Marian Marino. She was formally trained at Parsons School of Design. We work alongside our clients to help them design the perfect solution for all their room projects. We are available to support you from the very early phase of your home project or to assist with the more specialized parts (with hourly consultation). As your home is likely your biggest investment, you will be able to rest assured that we will be there from start to finish. One of our strengths is the ability to ascertain how best to assist you with achieving your goals. We believe in spending time with each client and in coming to know your personal design aesthetic. We want your home to be a reflection of your life story. Interior Solutions specializes in sourcing the perfect window treatments that will compliment and enhance the overall ambiance of your home. With 25 years of experience, we are a cut above the in-store designers or generalists in this area as we bring a elevated level of knowledge and experience to the table. We know that the correct treatments will, of course, provide privacy and functionality but must be in harmony with your décor. We also know that the huge amount of choice available can be overwhelming. Let our Hunter Douglas certified designers manage this process for you, from selection to installation. We pride ourselves with working with an installation team that provides highly technical ability and staying on schedule. Look to us for help with drapes, blinds and shutters! Another passion of Interior Solutions is the all-important choice of paint color. We know that selecting the perfect paint color can be quite a daunting task. No matter what your design palate is, we are very enthusiastic about helping you select the best paint options for your rooms. Interior Solutions will provide superior paint consultation with the end goal being a perfect blend of personality and taste. Interior Solutions stands out in the field of design because we tailor each project to your specifications. We look forward to helping you make your house a home. Julie Thome Draperies, Inc. is a full service drapery workroom, to the trade. Owner and designer, Julie Thome, provides fully custom design, fabrication and installation, specializing in hand finishing. It is her attention to detail and service-oriented characteristics that provide clients with superior quality window treatments and professionalism. 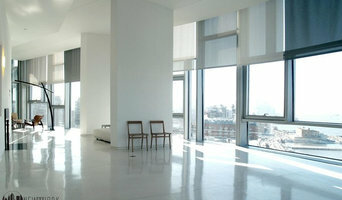 She works closely with the client in order to fulfill their expectations and design visions from concept to completion. To-the-trade Window Treatment Workroom A life-long sewer, fabric has been my passion forever. It is my joy to go to work each day and create beautiful window treatments out of wonderful fabrics for the talented designers who are our clients. The very best day is one when we can give meticulous attention to the most minute details that distinguish an average window treatment from the fantastic. We love working with decorators who are passionate about high-quality fabrics, treatments, and workmanship. At Budget Blinds of Nanuet and New City, we provide the in-home personalized service that you can't get from a big-box store. Covering all of Rockland County, we strive to truly understand your needs and our full services including measuring and installation will ensure your window projects match your visions. Our national buying power, industry leading warranties, and local ownership means we can provide the range of products and services that will enhance your home. Our free in-home design consultations, expert measuring, and professional installation allows you to create your style from within your own home. Our window coverings have become the go-to choice for industry experts & can be seen on many popular networks including HGTV’s “Property Brothers,” DIY series “George to the Rescue” & “This Old House” on PBS. Contact us today and let us help you design your home in your style. As the nation’s #1 window coverings franchise, Budget Blinds and Inspired Drapes provides you with access to more brands and more fashion-forward styles with window treatment options to fit any budget. We are dedicated to giving you design help to create a home that reflects your personality, and shows off just how stylish you are. We’ll bring samples and swatches of all types of blinds, fabric and roman shades, plantation/wood shutters, curtains and custom draperies to you, so you can see how they look in your home before you buy. Our in-home consultation beats running from store to store or taking your chances online. We’ll measure your windows, do the ordering, inspect your window coverings on delivery, install them perfectly and empower you with our "No Questions Asked Warranty"†! It’s never been easier to get exactly what you want. Let’s get started planning your new custom window coverings today! 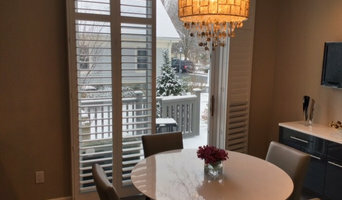 The Shutter Company is a great local source for plantation shutters. Since 2005, we have been working with homeowners and interior designers throughout Fairfield County. We have built our reputation on personalized service, quality shutters, and the attention to detail we give every project. Our shutters are available in both real wood and composite materials, and are always expertly installed. Smith & Noble is America's leading resource for window treatments. In business since 1987, Smith & Noble has outfitted over 8 million homes. Smith & Noble sells a variety of window coverings including wood blinds, natural woven shades, roller shades, shutters, draperies, honeycomb shades and much more. Powers Design offers full interior design service specializing in custom window treatments and coverings. We have our own workrooms on premises. Window Designs By Powers is a family owned and operated business. We have been located at 112 Paris Avenue since 1971. Greg and Barbara Powers founded the company. Now, Greg Powers Jr.-–the second generation–is operating the business with his wife Dana Powers, the head designer. We carry full lines from all the major companies in window shadings and drapery and upholstery fabrics as well as wall coverings. Smith & Noble is America's leading resource for window treatments. In business since 1987, Smith & Noble has outfitted over 8 million homes. We sell a variety of custom window coverings including wood blinds, natural woven shades, roller shades, shutters, draperies, honeycomb shades, and much more. We believe in the personal style expression of custom window treatments and in the importance of loving where you live! Established in 1993, we specialize in creating custom window treatments which are fabricated in our own workroom. Fabrics from international textile designers, decorative hardware, wallpapers, trims and custom upholstery services are all available along with a wide array of blinds, SHUTTERS and solar shades. Windows of Montclair, Inc. has a passion to work with you to bring your personal expression to life through your home's decor and custom window treatments. Our owner, Bonnie Quern, is a design and fabrication professional that has been featured in the Junior League of Montclair-Newark's Show House & Gardens show, New York Spaces™ magazine, and Window Fashions™ magazine. Put her amazing work in your home by contacting us today. Brian is a certified installer of INTERIOR SHUTTERS and an outstanding carpenter. Brian is able to create a completely integrated look for any type of shutter configuration and installation and works fluidly with Bonnie's designs. All of our custom fabricated work is performed in our combined workroom/design studio located in Essex County. For the past 20 years, Windows of Montclair, Inc. has been rewarded by taking on a variety of creative challenges to impress our customers. We look to build lasting relationships with our clients through our reasonable prices, high-quality work, eco-friendly products, and excellent customer service. Feel free to reach out to us, we would love to hear from you!